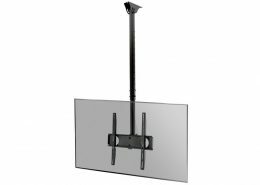 The practical MonLines TV mounts can be mounted on the ceiling and have a high load capacity. With the clever ceiling fixtures, you can take any desired position to experience new perspectives. Whether standing, lying or sitting – To enjoy a unique viewing experience, MonLines offers a variety of models that leave nothing to be desired. Also electrical solutions are possible. The monitor is easily attached to the ceiling mount with VESA mounting holes. Ideal for conference rooms, public spaces or your own home.